Hello, and welcome to Shelf-clips.com. For those who don’t know me, I am the Clip King. I have a doctorate in Shelf Clips, specializing in both Pallet Rack & Industrial Shelving. As you can see by our wide product offering, I have put in countless hours studying shelving shelf clips and the safety clips for pallet rack cross beams. 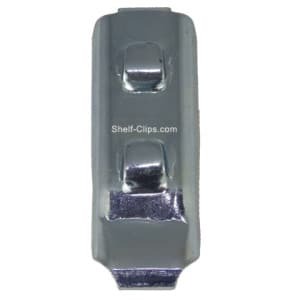 In this blog I am going to be talking about the Tennsco Q Line “Q Clip”, one of the most common shelf clips on the market. This clip is actually very special to me, because it was one of the first shelf clips that we welcomed in our warehouse. As stocking distributors of Tennsco Steel Shelving, we decided to bring in a couple of boxes of the Q Line T1 shelf clips as replacement parts for our customers. The clips ended up coming in very handy for a couple of our customers, so we decided to bring in a stock load of them. The rest is history. coating to give extra life to clip. Similar to many other compression clips found in warehouses today, the Q Clip has two prongs that engage in the post, and which hold the clip in place. The shelf then rests upon four of these clips. We sell these clips in boxes of 50, and they can typically ship out using UPS on the same day the order is placed. One of my favorite characteristics of this shelf clip is the engraved Tennsco name on the inside of this clip. This is very helpful for those in the industry unsure of how to identify the clip, and I personally respect all manufacturers who take the time to do this for their customers. I hope you enjoyed today’s Lesson with The Clip King. Stay tuned for more helpful shelving and pallet rack clip information.